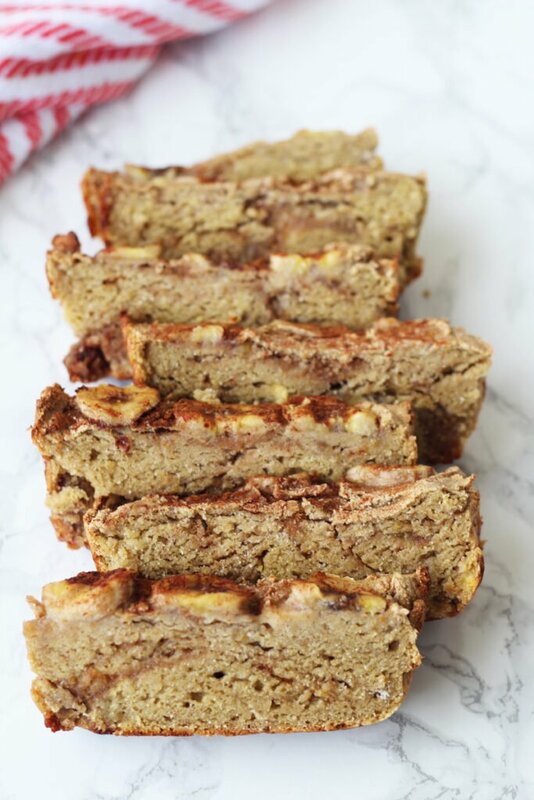 Banana bread… I’m obsessed. Always have been, always will be. Honestly, I don’t really remember having banana bread as a kid. I was more a chocolate chip cookie type kiddo… still am. But, I digress. I got hooked in the banana sweet stuff in high school. One day someone brought a loaf over for some occasion and it was a done deal for me. 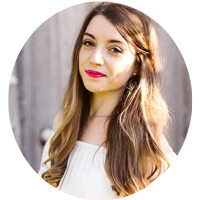 It quickly became one of my absolute favorite sweet treats and has been for years. I haven’t had banana bread in years for various reasons. 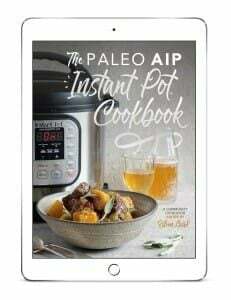 First of course, I’m Paleo/ AIP and no longer eat gluten, grains, eggs, dairy, or refined sugar, and I don’t really like complicated recipes that don’t come out close enough to the real deal. 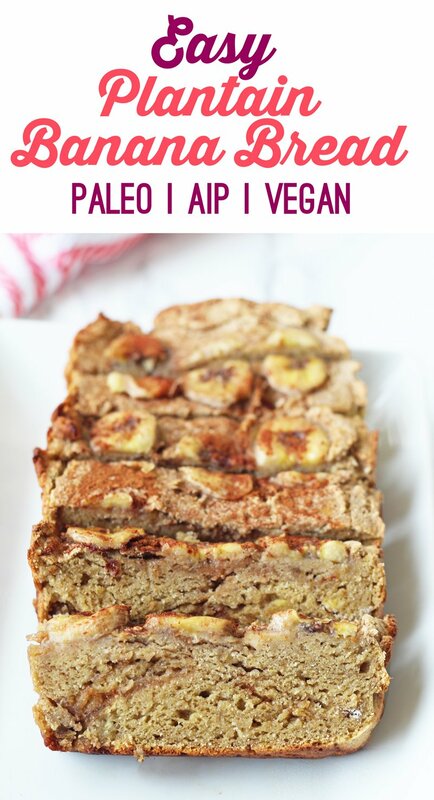 Until I made my own paleo and AIP plantain banana bread. So, why plantains? Well, they’re awesome. I never even had plantains until I went AIP and I was missing out for years. Plantains are basically just a more starchy banana that can be made into chips or tostones when they’re green (which is my favorite) or eaten as a sweet treat when they turn yellow. Because they’re more starchy, they help hold recipes up much better than just bananas alone, which was crucial for this recipe as there aren’t any eggs. Not even a gelatin egg! That’s why this is classified as “easy” 😉 Thanks to the plantains, this bread holds up perfectly, and all you have to do is basically mix it all together. Another standout ingredient in this bread in cinnamon. 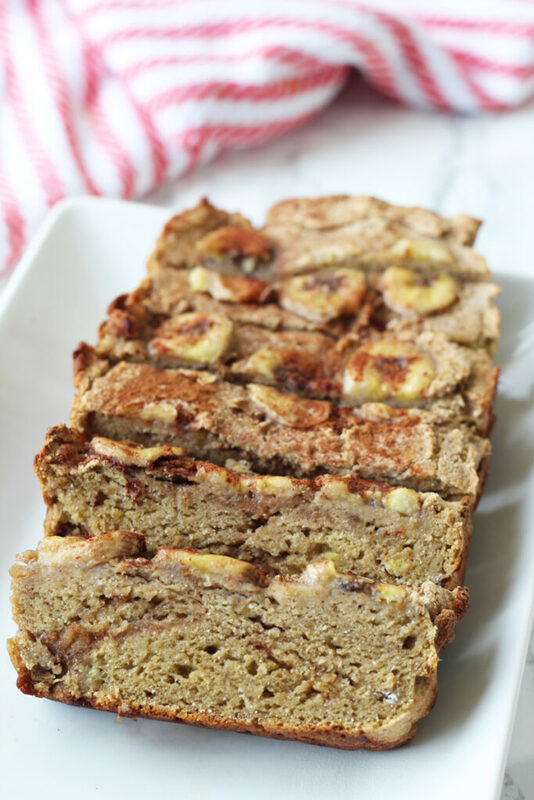 Cinnamon and banana are just such a great flavor combination. 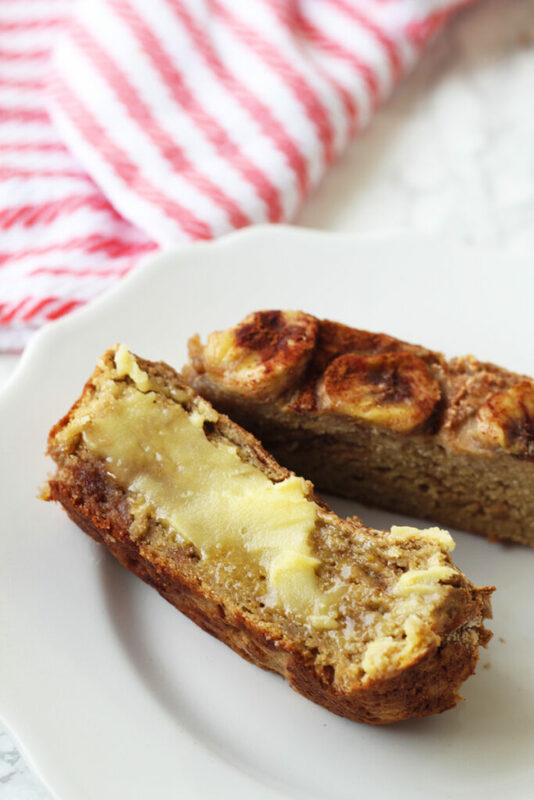 The cinnamon gives this banana bread a bit of a cinnamon sugar type flavor, while helping give it some more color! As for topping the bread, I went with slicing a banana into thin slices and layering it on top of the bread with an extra sprinkle of cinnamon. You can easily add chocolate chips (or carob for AIP) or even top it with shredded coconut. Yum! After you slice it, this bread goes great with ghee or grass-fed butter if tolerated. It’s also great with a bit of coconut oil, coconut butter, or even a homemade jam. I like banana bread out of the oven after it’s cooled for a bit, and my husband likes to slice it thin and toast it under the broiler! Either way, we both love adding ghee to it. This bread is easy to make, it holds together wonderfully, and has a subtle flavor that even non-AIP folks will love! Add optional toppings like sliced banana and cinnamon, etc. And that’s all there is to it! Sweet, cinnamon-y goodness that’ll make you feel super nostalgic! Thanks for the info. I was believing that Otto’s was the only one in existence. I found several in the Amazon search for $6/lb or even less. yea! That opens up a lot of possibilities! I echo Mary’s enquiries, because here on the west Coast of Canada, we can’t get Cassava flour at all (baring exhorbitant prices and customs duties). Thoughts, suggestions would be great! Hi, Val! Someone told me they used tigernut flour in place of cassava and it worked 🙂 I may even try just a 1/2 cup of more plantain? I haven’t tested either and can’t really guarantee it’ll come out like the picture, but let me know if you do! accidentally used arrowroot flour instead of tapioca, lets see how it turns out. turned out great. did mine in a muffin pan and took out after 20 mins. Cory, were your muffins dense or more fluffy and breadlike? Might try the muffin tin next time! Is this banana bread dense and chewy or more fluffy and bread-like? i was told i have an intolerance to bananas, amongst many other good nutritious foods… do you think there is anything to substitute? Are you using green plantains? They won’t turn brown if they’re green. They’ll turn brown in this recipe either way.